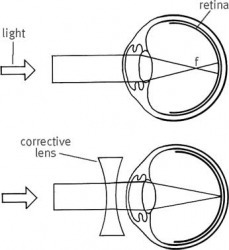 myopia top: When the focus (f) of light falls in front of the retina, vision is blurred. Myopia is nearsightedness, or a lack of ability to look at the big picture and consider complex or long-term ideas. Nearsightedness is an example of myopia. A lack of intellectual knowledge or curiosity is an example of myopia. "myopia." YourDictionary, n.d. Web. 15 April 2019. <https://www.yourdictionary.com/Myopia>. A visual defect in which distant objects appear blurred because their images are focused in front of the retina rather than on it. Also called nearsightedness . Also called short sight . Greek muōpiā from muōps muōp- nearsighted mūein to close the eyes ōps eye ; see okw- in Indo-European roots. (pathology) A disorder of the vision where distant objects appear blurred because the eye focuses their images in front of the retina instead of on it. A lack of imagination, discernment or long-range perspective in thinking or planning. From Ancient Greek Î¼Ï…Ï‰Ï€Î¯Î± (myÅpia, “shortsightedness"), from Î¼ÏÎµÎ¹Î½ (myein, “to shut") + á½¤Ïˆ (Åps, “eye"). 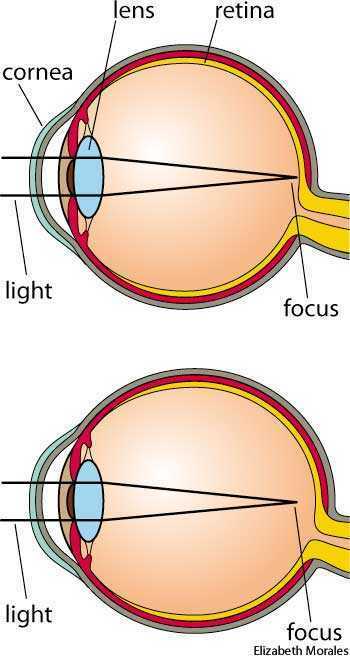 Patients with high myopia, greater than 6.00 diopters, have an increased risk of developing a retinal tear, hole, or detachment; a posterior staphyloma; a posterior vitreous detachment; or glaucoma. For the child with diabetes, fluctuations in blood sugars can cause swelling of the cornea of the eye, leading to transient increases in myopia, which stabilize once the diabetes is controlled. Since elevated levels of insulin may be associated with increased myopia; a diet low in those foods that increase insulin secretion, such as refined carbohydrates, may help decrease myopia. Some of the contacts that the company offers include contacts for individuals suffering from myopia or hyperopia, contacts for individuals suffering from presbyopia, sports tinted contact lenses, and contact lenses for therapeutic use. As the child enters school, distance vision becomes critical for learning, and children with prescriptions of at least 1.00 diopter of myopia or who have 20/40 vision or worse should be given glasses.